In the ongoing month of being and expressing gratefulness I just want to say what a joy it is to live in the SF Bay area. It was a beautiful day today! And I am grateful, specifically, for nice weather. 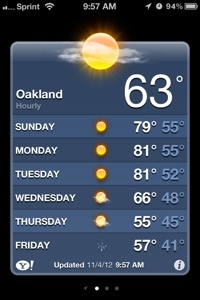 Not to brag, but . . .
. . . It’s supposed to be 81 degrees on Monday AND Tuesday! I have a pretty hard time dealing with the winter months. For the last 10+ years November through February has been really difficult. I’ve struggled with these hard months of blah weather and the hibernation they encourage and the memories that make the combination during that time period so difficult. But I think this year is going to be different, and I think the weather is giving me a reassuring sign to that effect. I am grateful for the beautiful weather.